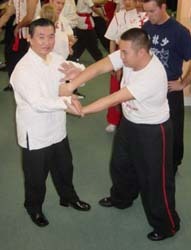 Grandmaster Wong demonstrating Choy Li Fut's intricate Dip Jeung. Special thanks to contributing editor, Sifu Neil McRitchie. Fighting Stars: We are honored to have with us tonight Grandmaster Doc-Fai Wong. Grandmaster Wong hails from a very rich tradition of legendary Chinese Kung Fu masters. Grandmaster Wong is a fifth generation grandmaster of the Choy Li Fut system of Kung Fu, descended from the founder Chan Heung. He is also the Grandmaster of the Yang style Tai Chi Chuan (Tai Ji Quan) by way of his own teacher Hu Yuen-Chou, who in turn learned from legendary Grandmaster Yang Cheng-Fu. Grandmaster Wong has dedicated his life to the martial arts and as a result he has become famous worldwide for his martial arts talents and attributes. He has written numerous Articles for martial arts magazines and publications including Black Belt and Inside Kung Fu. He has performed countless martial arts demonstrations, including numerous radio and television appearances. Grandmaster Wong's students travel from every corner of the globe to seek him out for his knowledge and in depth understanding of Kung Fu. Thank you for being with us tonight and welcome. Grandmaster Doc-Fai Wong: Thank you. Fighting Stars: Grandmaster Wong this is perhaps a broad question, however, can you tell us what are the necessary steps for proper advancement in the martial arts? In other words what are the key ingredients to building a solid foundation in Kung Fu? Grandmaster Doc-Fai Wong: Achievement in the martial arts is basically this?onsistently train everyday and work very hard. Fighting Stars: Obviously you have instilled this among your students because I have seen them training very hard. Do you believe that the student should learn the hard physical training combined with internal development or, do you recommend beginning with either one or the other method first? Doc-Fai Wong: The student must learn the external movement first. The beginner has to have some kind of physical work out because it is easier to understand than the internal workout. The students like to see results and by doing the physical workout they can see results right away. Eventually, they can gradually progress into internal development. However, you have to have both internal and external to have a complete system. Fighting Stars: Now over the course of your training you have learned many varieties of physical and spiritual training techniques from masters of the highest regard in the martial arts world. Which of your teachers had the greatest influence on you and what particular skill or character development did you achieve at that time in your training? Doc-Fai Wong: Actually I would say that was my second teacher Hu Yuen Chou. He is the one that gave me my life in the martial arts. I learned a great deal from two other masters also, but Hu Yuen Chou is the one that actually made me understand what the internal is and what Qi is and what the power is in the martial arts. Without the internal martial arts, without the strength and Jing development all the forms and fighting techniques would be useless. Hu Yuen Chou didn’t actually teach me many of the Choy Li Fut forms. Don’t get me wrong. He taught me plenty of forms but, what he really taught me was the essence of the system. I am more thankful to him than anyone else for really explaining to me how the system works. He taught me how to develop Jing and how to incorporate that power into the fighting movements. He taught me body mechanics and how to transform that into an effective fighting system. He taught me the scientific understanding as well as the artistic side of the fighting movements. His whole life was devoted to martial arts. He had a very deep knowledge of the martial arts and he knew how to bring that into his training and his teaching. Fighting Stars: What started you on the road to the martial arts? Doc-Fai Wong: When I was a little kid say about four or five years old. When I was in China I had been watching Chinese operas with my mom. By watching the Chinese opera I was able to see a lot of fighting scenes and a lot of acrobatics and a variety of traditional Chinese weapons. Particularly watching the Monkey King I became fascinated by all the fighting movements. 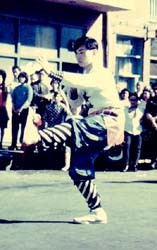 When I came to San Francisco in 1960 at that time there were not many Chinese living outside the confines of Chinatown. There was some discrimination between the non-Chinese and the Chinese when I was growing up. There were obvious cultural differences and the non-Chinese kids liked to pick fights or make fun of the Chinese kids. As a small boy being faced with these challenges I had to think?hat is the best fighting? And I realized that it was Chinese Kung Fu from being exposed to all the things that I saw in Chinatown. But, I was so young at the time that I could not afford martial arts and my parents wouldn’t pay for me to study. So I had to seek out anyone that knew martial arts and ask them to teach me. Eventually, I had to get a part time job so that I could make some money and join a school. A young Doc-Fai Wong affectionately called the "Five Animal Kid", circa 1965. Fighting Stars: Did your parents encourage you in the martial arts. Doc-Fai Wong: No, in fact it was quite the opposite. My grandfather on my mother side was an herbalist and martial artist. My mother learned some herbal medicine from him, but she had no interest in the martial arts. You have to understand at this time most of the parents in Chinatown did not look at Kung Fu and Kung Fu schools as very respectable. My parents were afraid that the Kung Fu schools might be like the triads or Chinese Mafia and they did not want me to join such a school for that reason. Their thought for me was that I should get a good education and that I should stay away from Kung Fu because fighting was for gangsters and hoodlums. That’s why many parents didn’t allow their children to learn at the martial arts schools. And I really couldn’t blame them because at one time it was really like that. Fighting Stars: What was your training like when you were a child? Can you give an example of your earlier training in the martial arts? Doc-Fai Wong: Right after school I would go directly to the kung Fu studio. At that time the studio was only a block away from where I lived. Fighting Stars: And who was your instructor at that time? Doc-Fai Wong: That was great grandmaster Lau Bun. In the traditional Chinese school at that time there was no formal class training. So you would go there and they would show you a couple of moves and you would have to work on those moves all day. You could stay as long as you liked or you could leave and go home if you wanted to. So, you had to be really self-motivated to get through this type of training program. Fighting Stars: Can you tell us what types of things you did in your training as you progressed? Doc-Fai Wong: So when we followed Master Lau Bun’s teaching. We were allowed to work on our own on different forms or we could train with our buddies. We started first with horse stance training. It was very hard a lot of students did this for maybe three months and then get tired and then drop out. After you trained the horse stance training long enough then they would teach you the first form. Once you learned the first form then you would learn a couple of fighting drills and you would work on them over and over again. Fighting Stars: Now did you carry on that tradition of teaching or did you modify this for your own students. Doc-Fai Wong: Actually, the way that we teach now is much better than in the old days. I have tried to improve upon tradition. For example, if you go to school you can learn Math or English or Science. But, in school you don’t have to learn the whole English language before you can do Math and with the martial arts it’s the same way. Nowadays we teach the stance work like in the old days, but at the same time we teach the basic forms and self defense techniques and other movements for the beginner so that they really feel like they are learning something instead of just standing around being bored. Fighting Stars: So, in teaching in this way do you believe that you can elevate your art to a higher level and attract more students at the same time? Doc Fai Wong: Attracting students is not the main emphasis. What I want to do is make it fun for the student so that they can enjoy the martial arts training. Fighting Stars: You have many students and they all look up to you as someone to emulate. Who were some of your martial arts heroes when you were growing up? Doc Fai Wong: There were many masters in Chinese history that we learned about. Some of these were fighters for the revolution. They were many past masters that I highly respect like Yang Cheng Fu. Fighting Stars: You descend from some of those great masters in your own lineage. How have you passed on their tradition? Doc Fai Wong: Yes, my master Hu Yuen Chou, who learned from Grandmaster Yang Cheng Fu, told me not to hold back like some of the older masters did. He said go ahead and teach the students, regardless of race or cultural background. As long as they are good human beings with a good heart they must be taught the whole art.